In a world first, a carbon fibre drill rod has successfully drilled in mineral exploration at the Deep Exploration Technologies Cooperative Research Centre’s (DET CRC) Drilling Research and Training Facility at Brukunga. 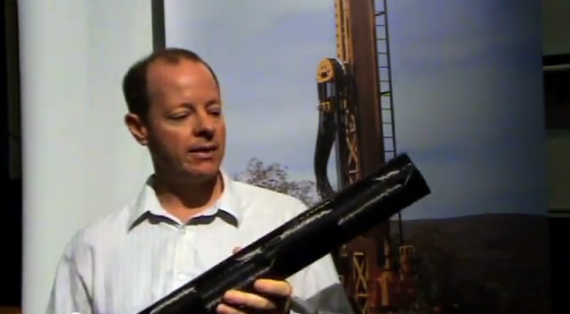 The carbon fibre drill rod, produced by Queensland-based Teakle Composites, will revolutionize the drilling industry according to CEO of the DET CRC Professor Richard Hillis. “It will provide a stronger, lighter, safer and smarter drilling rod than the traditional steel product,” he said. “Teakle’s prototype drill rod is more than 50% lighter than a steel rod and there is the potential to embed a sensor within the wall of the rod. “This will enable drillers to collect information about the type and value of material they are drilling through, the precise direction they are drilling and also about potential drilling hazards. “Until now this has not been possible as it is very difficult to embed sensors in steel rods. Also, many types of sensors are incompatible with steel and metals, sensors such as borehole radar and neutron tools which are used to detect the composition of rocks. “Composite materials do not have these limitations, so drillers will have the ability to make important decisions about where and what they are drilling in real time. Teakle Composites is an Affiliate member of the DET CRC, working in partnership with the CRC to design and manufacture the drill rod prototypes which are made from carbon or glass fibres, embedded in a tough plastic with steel ends. The prototype weighs just 7 kg compared to an all-steel version that weighs 17 kg. The DET CRC has commenced testing of the prototype drill rod on the Boart Longyear SC9 drill rig at its Drilling Research and Training Facility at Brukunga. The prototype rod is being used to drill through hard rock at various rotational speeds and loads to evaluate its performance. “In our first test we drilled almost 100 meters through hard rock,” CEO of Teakle Composites, Phil Teakle said. We know we are on the right track. “The next step is to demonstrate we can meet our strength targets in the laboratory, then undertake further testing on a drill rig. The latter will reveal any problems not identified in the laboratory – these could include abrasion and vibration. According to Professor Hillis, the first composite rods are on track to be commercialised within three years. “Such a continuous, lightweight drill string with embedded power and sensors would totally revolutionise the drilling industry. “Once a commercialisation agreement is reached with a supplier, the technology will be made widely available to the industry, but CRC Participants may have exclusive first rights of uptake,” Richard said.